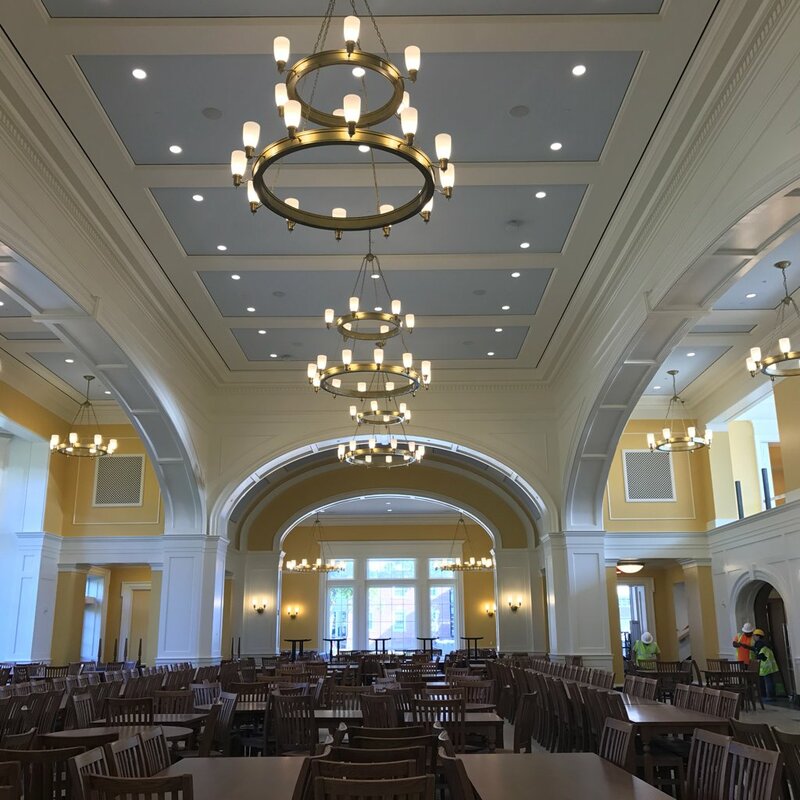 Hoover Hall, the University’s new 48,600 square-foot dining hall, is "a very special building and transformational addition to the DePauw University campus," said Melanie J. Norton, vice president of development and alumni engagement, tonight. 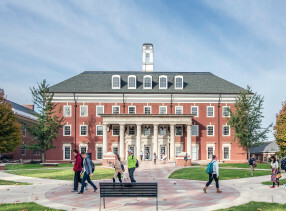 About 330 DePauw students, alumni, faculty, staff, community members and friends of the University gathered to formally dedicate the structure, which sits in the shadow of historic East College in the center of campus. The $32 million project, which took 29 months to complete (ground was broken on May 17, 2014), came in on time and under budget. 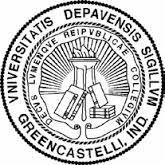 The lead gift came from R. David and Suzanne A. Hoover, both 1967 graduates of DePauw. 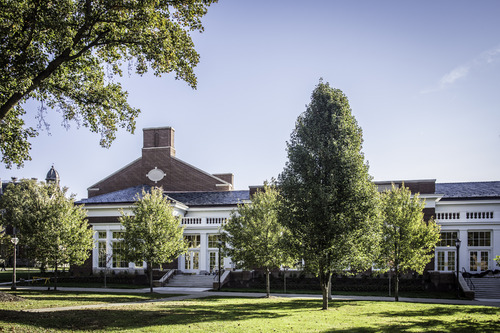 The Hoovers, according to DePauw President D. Mark McCoy, "recognized that DePauw builds lifelong relationships through a strong sense of community. 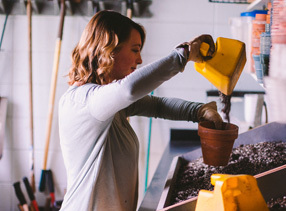 And that community needed a place to meet, to eat, to interact, and to share." 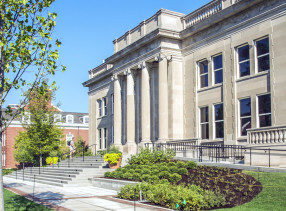 Suzanne Hoover tonight described how she and her husband, the former CEO of Ball Corporation and past chair of DePauw's Board of Trustees, met with different architectural firms before choosing Robert A.M. Stern Architects. "It has been a long journey since we began even thinking about this and making our commitment," she noted. "But it has been an exciting one and definitely worth the wait now that we are inside and can see what it looks like." "Seeing it tonight, it's even better than we expected," Dave Hoover said. 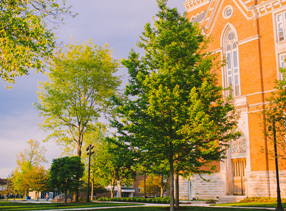 "We hope and expect it to be a place where people connect, communicate, build relationships and improve and strengthen DePauw's culture." 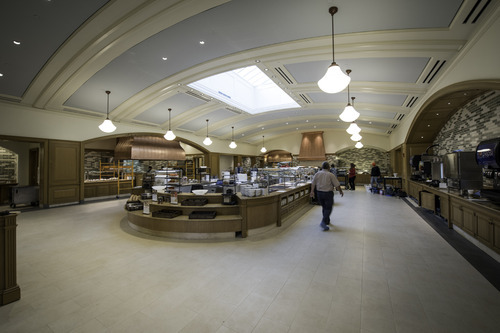 The new dining hall is a product of the University’s Campus Master Plan, which was approved by the Board of Trustees in October of 2010 and called for the transformation of the campus core into a place of greater connection, contemplation, and creativity. 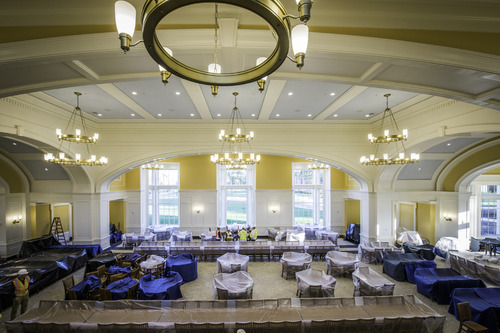 Hoover Hall will serve as the primary dining space for first-year students and upper-class students living in University housing and will serve its first meal to undergraduates Monday morning. Hoover Hall will seat more than 600 students in the main dining room, with dozens more able to dine and come together in an array of smaller dining rooms. 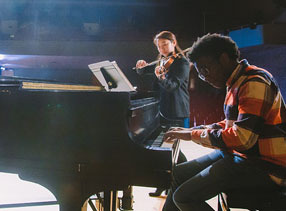 Dr. McCoy noted, "In Hoover Hall, the opportunity to fulfill our most basic need for nourishment will also encourage us to join together, connect and to create a culture of sharing and belonging." Douglas I. Smith '85, a DePauw Trustee and chair of the board's buildings and grounds subcommittee, praised the more than 1,000 craftsmen and women who put more than 145,000 hours into the project that is being celebrated tonight. Their dedication, he noted, is obvious in the beautiful detail seen throughout the Hall. Vice President Norton declared, "This magnificent building fills a purpose far beyond food or shelter: it invites a new heartbeat to the center of campus and changes the way those who live and learn here will connect, interact and collaborate. It will feed us in ways beyond the obvious and it's influence will be felt for generations to come." 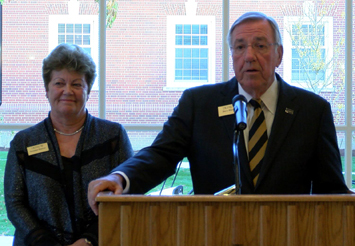 President McCoy concluded, "It is remarkable to think of the ways this building will shape DePauw. How many students, like Dave and Suzanne, will meet their lifelong companion within these walls? 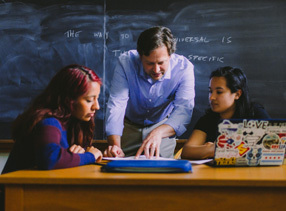 How many times will a professor start a conversation over a meal that completely changes the trajectory of a student's life? How many friendships will be made and deepened here? How many problems solved? How many questions answered? How many imponderables will be pondered within these walls? 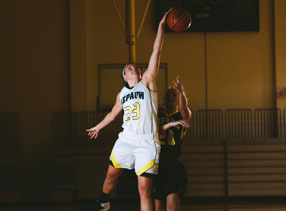 Such moments are the fabric of the rich and rewarding DePauw experience, and now have a home." A schedule of Old Gold Weekend events, which include tomorrow's inauguration of Dr. McCoy, is available here. Dave and Suzanne Hoover are among six alumni whose contributions to DePauw are being celebrated with new portraits on campus, which were unveiled last night. Read more here.